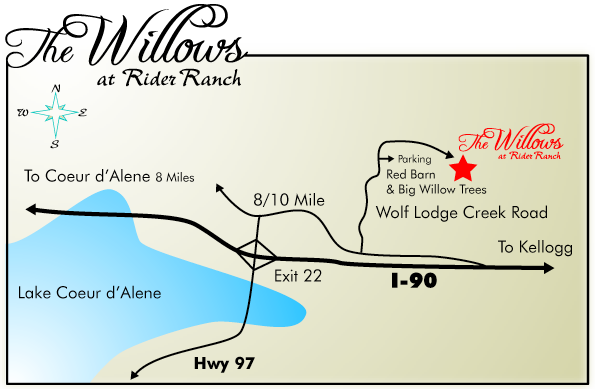 Our Ranch is located approximately 20 minutes from Coeur d'Alene. Traveling on I-90, about 8 miles east of Coeur d'Alene, turn off on Exit 22. Go left across the overpass and then turn right at the stop sign (just past the end of the overpass). hill there will be a house (with medium brown wood siding), turn left as though you were going to that house. As you turn there, you will also see a log barn up across a small field. That barn is your destination. (there is a sign on the gate), and we will park you by the barn. on the left side of Wolf Lodge Road. We also will have lots of lights on at the barn. 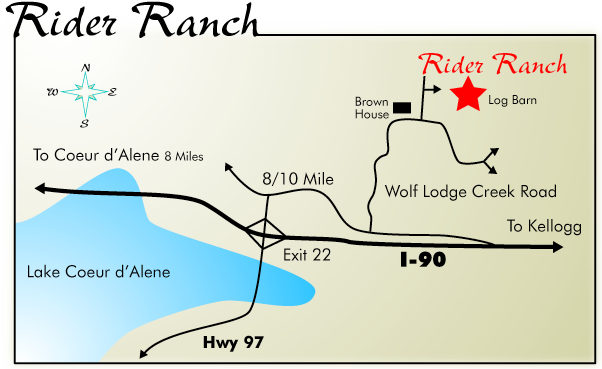 The Ranch is located approximately 20 minutes east of Coeur d’Alene. Traveling on I-90 from Coeur d’Alene, turn off on Exit 22 (about 10 miles from town). Go left over the overpass. Immediately at the end of the overpass is a stop sign – turn right. and gray and green barn tucked against the back hillside. Parking is in the field, look for a sign that marks the driveway.